This relatively simple preparation makes an elegant entrée. The glaze is the secret to the complex flavor. 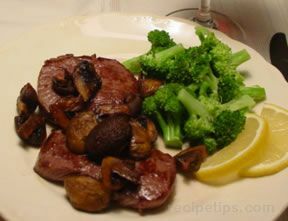 Remove any fat or silverskin from the tenderloin and slice into 6 approximately 1" thick medallions. Mix wine, soysauce, and garlic in a non-reactive container or a zip-top plastic bag. 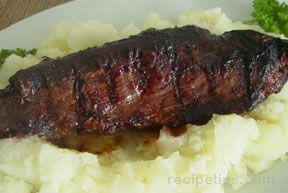 Add medallions and marinate for about an hour, longer if you suspect the meat may be tough. Remove medallions from marinade and pat dry. 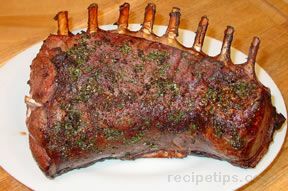 Cook marinade over medium-high heat until reduced to about 1/2 cup, stir in fruit preserves, and set aside. Heat skillet, add butter or oil. Lightly salt and pepper medallions. When skillet is hot, add meat and cook to desired doneness, but not past medium (pink center). While meat cooks (it will only take a few minutes), bring the marinade mixture to a boil and reduce to about 1/4 cup. 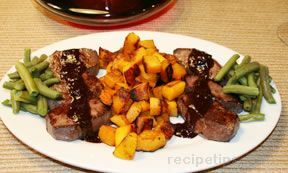 Serve medallions on warmed platter or plates with sauce spooned over.